All white decor, alfresco seating under a tree, Sunday brunches with bottomless sparkling wine and delicious pizza—Olive Bar & Kitchen is just as dreamy as it sounds and is unarguably one of the best spots in the city to unwind at. Now imagine all of that but with a cool breeze by the beach. Enter Olive Bar & Kitchen, Goa. 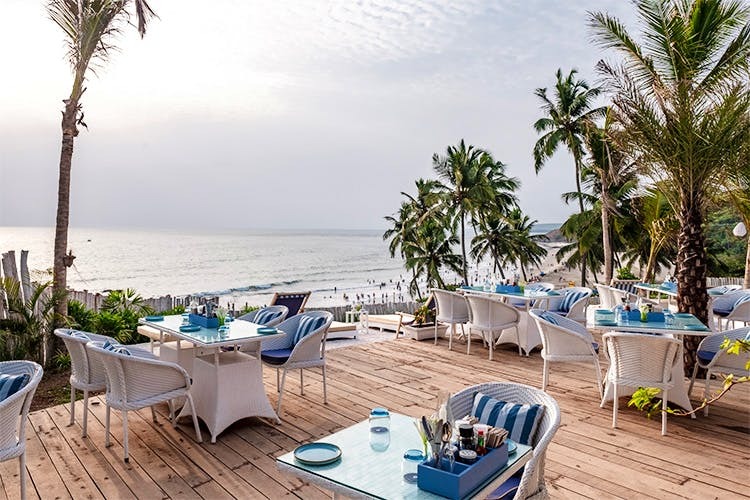 Yep, Vagator Beach just got its own Olive and the white walls and wooden furniture along with palm trees swaying in the wind are exactly what brunch goals are made of. And yes, there are hammocks! Sitting on a cliff overlooking the beach, you can munch on their signature Mediterranean and European dishes along with delicious seafood that infuses the Goan culture into the menu. And, there’s always the thin crust pizza! The restaurant will also be open all through the monsoon season, so if you’re planning a trip to Goa, make sure you go for a breezy brunch at Olive.